Peat was cut into blocks and burned on kitchen hearths for centuries in Ireland, Scotland and other countries. But in the mid 1800's large machines were designed to compress the peat into blocks for a wide variety of uses...to produce gas; use in steam engines; make gunpowder, paper, pavement and roofing tiles... A far cry from gathering peat near the home for cooking and heat. "Donnie took up the wood and peats deftly between his fingers, and laid them anew across the hearthstone, blowing up the fire at the same time into a cheery blaze. 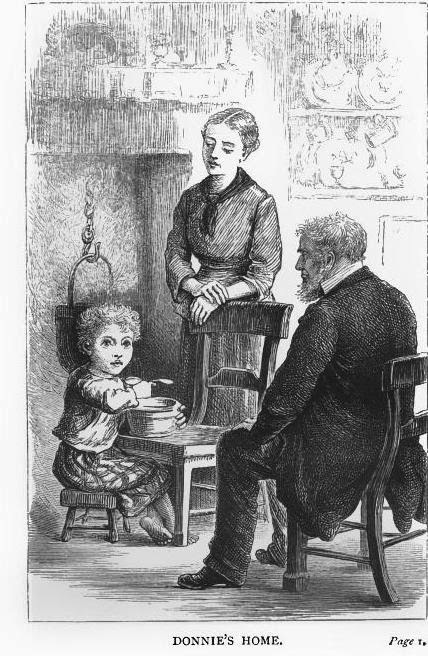 Donnie hung the round pot on the chimney-hook with a swing and an air, as he had seen the gipsies do; and he filled the little kettle too, and then sat down opposite Jeanie to blow up the flame with the wooden bellows, to watch the fire dance cheerily, and to see the kettle boil…the porridge-pot bubbled up… presently to a brisk boil, and Donnie tumbled in handfuls of meal, and stirred his porridge vigorously with a cheery smile…. [and looked] at the brown tea-pot cosily nestled in the peat embers…"
FOR THE MANUFACTURE OF PEAT FUEL. An essential feature of these machines, and this process of manufacture, is, that a portion of the water contained in the crude peat is extracted by mechanical means in the process of manufacture, leaving the blocks, as they come from the mill, dense, strong, and in condition to be haked or piled up under cover and left to cure. Another marked peculiarity of this process, as shown in its results, is, that the original organization of the peat is entirely destroyed, and instead of a soft, porous, sponge-like mass, we find, as a product, a material having more the appearance of a mineral substance, which breaks with a fracture similar to stone, and which, even when finely pulverized, can never again be dissolved in water, but retains permanently its mineral-like qualities. The cost for labor and power to manufacture the fuel is less than two dollars per ton. 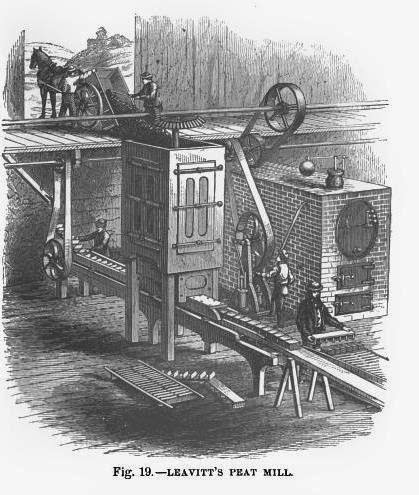 The machines are of two sizes: one is of the capacity of eighty tons of crude peat per day of ten hours, producing forty thousand blocks, measuring 10X4X2 1/2 inches, weighing about four pounds each, and yielding, when dry, a product of from twenty to twenty-five tons of good merchantable fuel. Requires about six-horse power to operate it to its full capacity. Weighs about two and a half tons. Price, twenty-two hundred dollars.